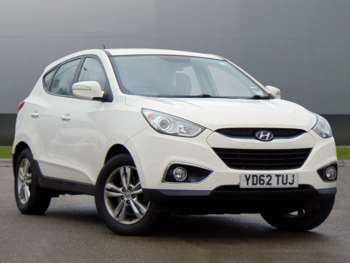 As the updated second-generation of the Tucson, the Hyundai ix35 was a slightly confusing name change for markets outside of North America and South Korea. It has an inventive torque system, which directs power to each weel as required. This provides an advantage over traditional 4WD systems. This car is extremely robust, both inside and out. With all the seats up, you still have 591 litres of luggage space, which increases to 1436 litres when they are folded. There is plenty of leg and headroom too, and it's one of the best-looking SUVs on the used car marketplace. A range of special features is available, including heated seats, Bluetooth connectivity and a media pack in certain premium models. In the Euro NCAP test, it secured a 90% adult safety rating, alongside an 88% children safety rating, This gave it an overall 5-star rating for safety, placing it above many competitors. Generally speaking, the car provides a great drive for a large family SUV. Its suspension is a little clanky over bumpy surfaces, but the steering is very responsive. It's not a class leader in any respect, but it's a great all-rounder, making it more than the sum of its parts. The entry-level models are feature-packed, and the premium versions include useful extras to make driving easier.